Welcome to the August 13, 2018, issue of "Newtown News Update." The opinions expressed here are solely the those of John Mack and do not reflect the opinions of any other person or entity. If you are not a subscriber, please subscribe here. If you are a subscriber and do not wish to receive further updates, please use the "Unsubscribe" link at the bottom of this email. 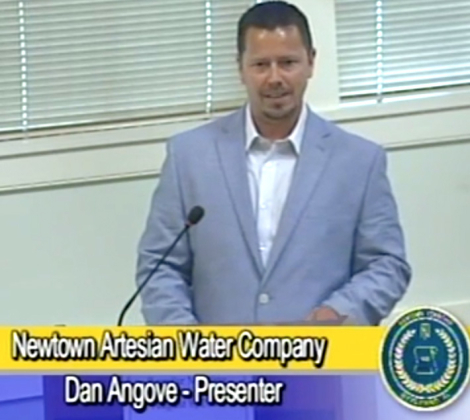 Dan Angove, Assistant General Manager, Newtown Artesian Water Company, gave an update on the quality of Newtown's drinking water at the August 8, 2018, Board of Supervisors (BOS) meeting. He answered my questions about Maximum Contamination Levels (MCLs) of PFAS - perfluorinated compounds - in the town's drinking water. Mr. Angove was invited to present his report after the U.S. Environmental Protection Agency (EPA) hosted an all-day Community Engagement session in Horsham on July 25, 2018. At that meeting, which I attended, Horsham, Warminster, and Upper Dublin township officials told the EPA that their residents should not have to pay to supply to their residents water uncontaminated with PFAS when the cause of the original contamination is known to be the U.S. military. From what I heard at that meeting, there is a difference of opinion as to what the Maximum Contamination Level should be for these compounds. The U.S. EPA and the Pennsylvania Department of Environmental Protection (DEP), for example, have recommended 70 ppt (parts per trillion) as the MCL for drinking water. The Newtown Artesian Water Company adheres to this recommendation. Unlike Pennsylvania, however, the New Jersey DEP has not followed the EPA’s recommendation and set the MCL at 13-14 ppt. Other states as well have set lower limits. Meanwhile, the Agency for Toxic Substances and Disease Registry (ATSDR) – a federal agency in the Centers for Disease Control - drafted limits on how much of several of the most common PFAS chemicals are safe for humans to consume that are MUCH lower – as much as 10X lower - than the limits set by the EPA. This would put the minimum within the single digits part per trillion. At the EPA meeting, several local municipalities such as Upper Dublin and Horsham have indicated that they consider safe levels to be below 5 ppt. Hear their comments in videos from the EPA meeting here. In preparation for Mr. Angove's comments before the Newtown BOS, I created the following chart to summarize current thinking on safe levels of PFAS in drinking water. 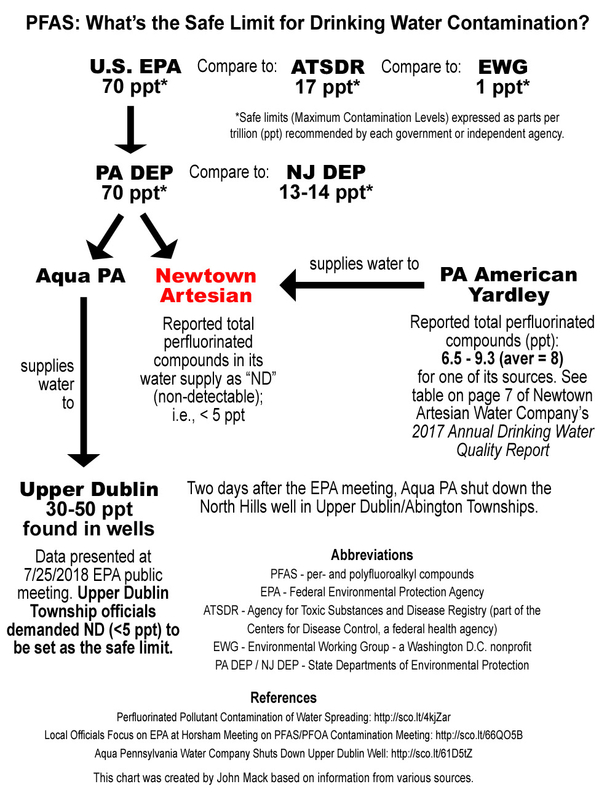 The PA American Yardley data refers to one source in that company's water supply, which, according to Mr. Angove, is not purchased by Newtown Artesian. In closing. Mr. Angove said that going forward his company will test for PFAS in all its water sources and report the results although it is not required by the PA DEP to do so. The following brief summary is based upon the official online video of that meeting, which you can view here. Planning Commission: Allen Fidler, Chairman, gave a synopsis of the August 7, 2018 meeting regarding the Arcadia Green tentative PRD #3. 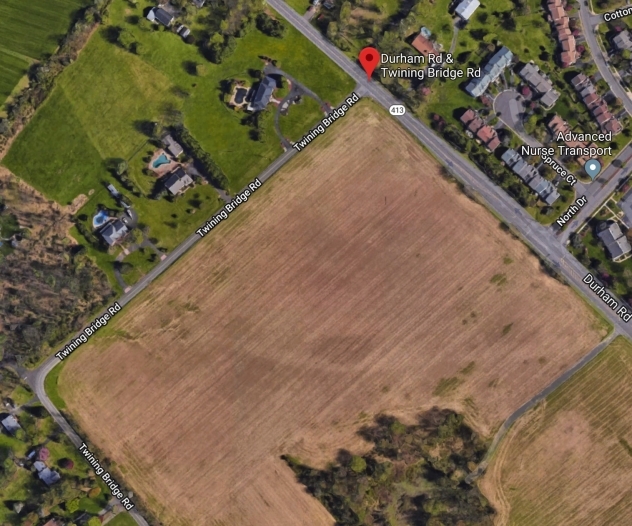 Arcadia Green - Tentative PRD Hearing, Part 1: Jason Duckworth, President of Arcadia Land Company, and Attorney John VanLuvanee, presented the plan and testified. Water Quality: Dan Angove, Assistant General Manager, Newtown Artesian Water Company, gave an update on Newtown's drinking water. He answered questions from Supervisor John Mack about Maximum Compliance Levels of PFAS - perfluorinated compounds - in the town's drinking water. See article in this issue above. Swearing in of New Supervisor: Mr. Dennis Fisher was sworn in as a Supervisor by District Judge Mick Petrucci. Regular Session, Wednesday, August 22, 2018: Continuation of Arcadia Green PRD Hearing. Work Session, September, 2018 (TBD): Toll Brothers Archdiocese Property - Sketch plan/Presentation. According to an April 9. 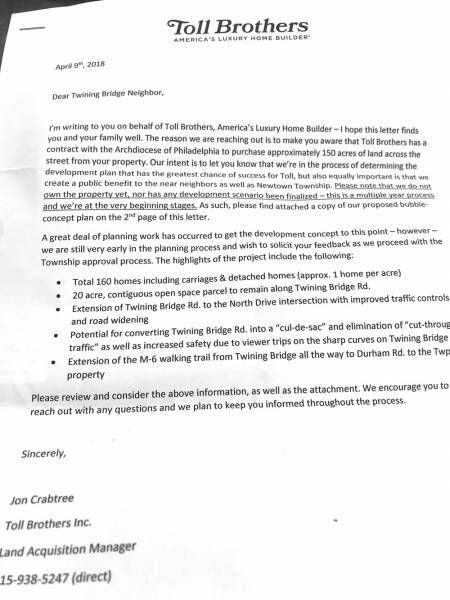 2018, letter from Toll Brothers to Twining Bridge Road residents (here), the developer has a contract with the Archdiocese of Philadelphia to purchase 150 acres of land southwest of the corner of Durham Road and Twining Bridge Road. According to the letter, the plan calls for a "Total 160 homes including carriages & detached homes (approx. 1 home per acre)." NOTE: No decisions are made at "Work Sessions", but the public can attend and make comments. 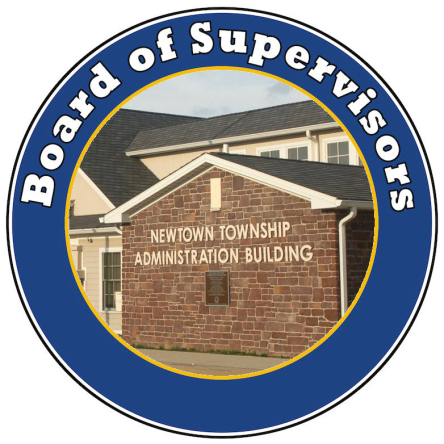 All BOS meetings take place at 7:00 PM, in the Newtown Township Public Meeting Room, 100 Municipal Dr, Newtown, PA 18940. 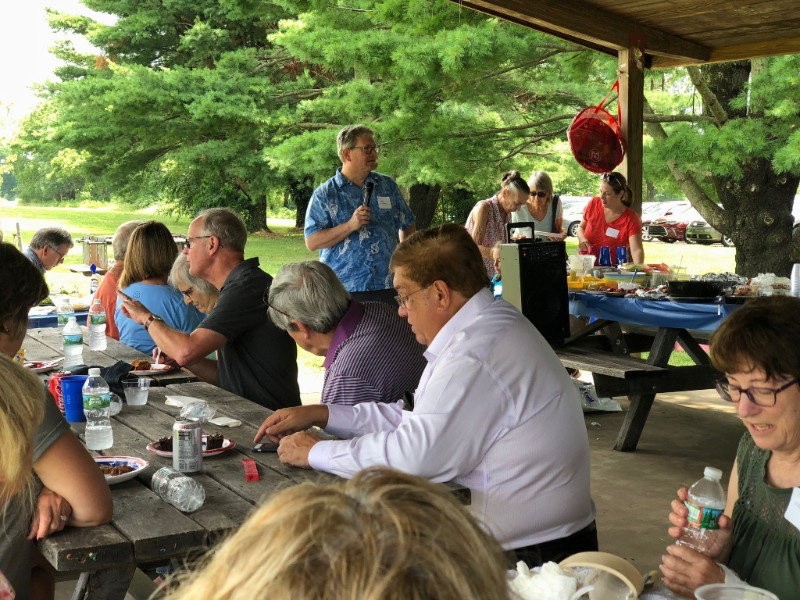 Club Chair George Skladany addresses group at the July picnic. Join us on Wednesday, August 15th, from 7 to 9 p.m. at the Temperance House, 5 S State St, Newtown, PA 18940. Visit the New Newtown Dems Website!